To Mimer on the "Ships starting with M" page. From Bjørn Milde's postcard collection. However, I suspect this might be the ship that sailed as Bestik during the war; can anyone confirm? Built in Bergen in 1906 (1905?). According to this external page, she was delivered from Bergen Mek. Verksted in Jan.-1906 (137) as Mimer to Joh. E. van der Ohe & Lund e.a., Bergen. From 1915, owned by A/S D/S Mimer (Joh. E. van der Ohe), Bergen, no name change. From Sept.-1918, A/S D/S Mimer (Jacob Kuhnle), Bergen, same name. Owned from Apr.-1919 by Skibs A/S Maderas, Kristiania/Oslo. 1926, D/S A/S Mimer (Thorvik & Gjerpen), Oslo. From May-1930, D/S A/S Truls (Thorvik & Gjerpen), Oslo, still as Mimer. 1933, D/S A/S Truls (M. Thorvik), Oslo. From Apr.-1935, Rederi A/S Mimer (S. A. Larsen & E. Thorvildsen), Oslo. 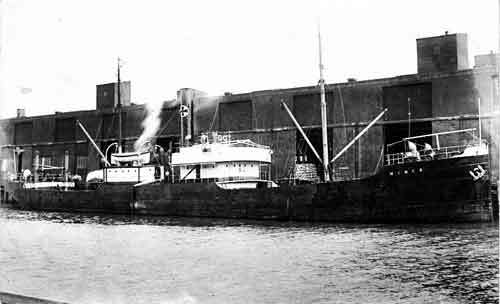 A. Hague has included Mimer in Convoy HN 12 (external link) from Norway to the U.K. in Febr.-1940, but this was a Swedish ship by that name - see also my own page about HN 12. According to Page 1 of the archive documents, she was in Hong Kong when war broke out in Norway on Apr. 9-1940, having arrived there that same day from Saigon. The document also shows some of her 1941 voyages, which continue on Page 2. It'll be noticed, when going to Page 3, that her voyages stop on May 19-1942, when she arrived Bombay from Cochin. Back to Mimer on the "Ships starting with M" page. The company had another Mimer after the war - see Post War details for Bestik.